Official figures for the past five years put the number of deaths or serious injuries on the road caused by illegal or defective tyres at a shocking 989. According to a recent Sunday Mirror investigation carried out in conjunction with Trading Standards, however, traders continue to sell potentially lethal part-worn tyres to unwitting motorists. Part worn tyres which have not been re-treaded must clearly show the relevant ‘E’ mark alongside which ‘PART-WORN’ must be permanently and legibly applied in letters at least 4mm high. These words cannot be hot branded or cut into the tyre. Part-worn tyres that have been re-treaded must be marked in a manner also set down and explained at length in the act. The recent Sunday Mirror and Trading Standards sting, therefore, set out to investigate whether the tyres sold met the criteria set forth in these regulations. In order to assess the safety and legality of part-worn tyres sold, Trading Standards watchdogs posed as motorists in order to buy such tyres from dealers in County Durham. The tyres bought were then inspected by Tyresafe, a charity founded in 2006 which is devoted to tyre safety. Of the seven tyres purchased by Trading Standards and tested by Tyresafe, fully six were found to have serious faults which fell foul of the aforementioned regulations. Two of the tyres possessed serious damage from being under-inflated, two more had damage to the bead, one had an illegal reinforced rubber section inside the wheel and the other contained water due to having been stored incorrectly. 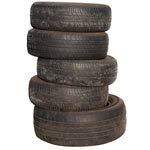 Five of the seven tyres, too, were found to be illegal even before the faults were discovered due to the fact that they had not been marked with ‘PART-WORN’ as required by point four above. As if to add insult to injury, what’s more, the only legal part-worn tyre from the investigation was found to be more than 18 years old. At Clover Auto’s we care most about our customers and would never supply tyres that could put lives at risk. Find out more about our tyre service.